Lightning cracked and rain slashed violently against the windows as US tycoon Donald Trump and Panamanian President Ricardo Martinelli cut the ribbon to open the Trump Ocean Club International Hotel and Tower. "I think this hotel is truly magnificent; you look at Panama's skyline and you see how this one truly stands out," Mr Trump raved at the opening this month of the giant sail-shaped building emblazoned with his name. "Our bookings are through the roof. Everyone wants to be here and I really think it's going to be a tremendous success." 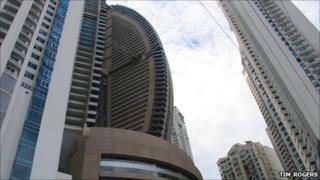 President Martinelli was equally excited about the $430m (£266m) building - one of several skyscrapers crammed onto a small residential cul-de-sac on a land-filled point known as Punta Pacifica. "I would like to thank Donald Trump for coming to Panama and allowing this wonderful building to have his name," Mr Martinelli said. "This makes Panama very proud." Yet outside, the torrential downpour flooded the streets' overworked drainage system, turning the peninsula into a swamp island. Hundreds of construction workers coming off the building sites on either side of the Trump hotel were stranded. "What a mess," one builder said, as he and dozens of others jostled to pile onto the back of a cattle truck - one of the few vehicles able to get off the flooded peninsula. Mr Trump and Mr Martinelli also had to plough through the flooded streets in their 4x4s. "It was unbelievable and he got caught in it," Trump developer Roger Khafif said the following day. "Everybody is upset." The incident was symptomatic of a city that has grown faster than its infrastructure. Five years of unprecedented economic growth - and a continued projected growth rate of 8%-9% over the coming years - has turned Panama into a regional giant on wobbly legs. Since 2007, 50 skyscrapers have been built or are being finished within the next year. The size and scale of Panama's growth goes far beyond the rest of Central America. But the growth spurt raises serious questions about overdevelopment. Already Panama City is feeling the consequences of building its first-world hopes on third-world infrastructure. "Panama's infrastructure has not grown at the same speed as the economy or city - especially in the past four years," says Public Works Minister Federico Jose Suarez. "The country did not visualise growth at this rhythm. [Panama] is a victim of its own success." In an attempt to play catch-up, the Panamanian government will invest $20bn (£12.4bn) in public-works infrastructure in the coming years, including a $5.2bn expansion of the Panama Canal scheduled for completion in 2014. "This is the investment we need for the next 50 or 100 years, so the country can keep growing and we can administer that growth in a responsible manner," Mr Suarez said. Panama City could have used some of that long-term planning five years ago. Instead, it has grown as haphazardly and unregulated as a 19th Century gold-rush town. On Punta Pacifica, the ministry of public works has been battling for the past two years to keep construction firms from dumping cement, rubble and sand into the failing drainage and sewerage systems. It has been a losing battle. Mr Suarez says the government has spent more than $2m in constant efforts to clean Punta Pacifica's subterranean rainwater pipes. They get so clogged with cement that city workers have to go into the drainage system with pickaxes. To make matters worse, other developers have illegally tapped sewerage pipes into rainwater drainage systems that dump directly into the ocean. "As long as this situation continues, no amount of maintenance will work," the minister says. Even as Panama's building frenzy slows, questions remain about who is going to fill the buildings that have already been built. Many of the new residential blocks remain mostly darkened at night, suggesting there is not a long waiting list for occupancy. Developers insist units are being sold to corporations, seasonal tenants and wealthy foreigners. But Jose Manuel Bern, one of Panama City's main developers, says he is worried that his country's development and economic growth is relying too much on luck and not enough on planning. Roger Khafif, of The Trump Ocean Club, admits that allowing all the buildings to go up on Punta Pacifica before building the infrastructure to support them and the people who will some day fill them is a bit like putting the cart before the horse. "They should have done that first; I would say that was more important," he says. "What's the use of bringing everyone here and just piling them up in the city?"